GOURTED GALL STONE SCOOP 28CM / 11"
MAYO MALLEABLE GALL STONE PROBES 33CM / 13 1/8"
SILVER (IRRIGATING CANNULA) GALL DUCT PROBES / SCOOPS 16CM / 6 1/2"
DESJARDINS GALL STONE PROBE 28CM / 11"
HARD AGE POTTS--DE MARTELL GALL DUCT SCISSORS 22.5CM / 9"
POTTS--DE MARTELL GALL DUCT SCISSORS 22.5CM / 9"
GRAY (CHOLECYSTECTOMY FORCEPS) GALL DUCT FORCEPS (1:2 TEETH) 22CM / 8 3/4"
GRAY (CHOLECYSTECTOMY FORCEPS) GALL DUCT FORCEPS 22CM / 8 3/4"
MIXTER MOD. GALL DUCT FORCEPS 23CM / 9"
MOYMIHAN MOD. 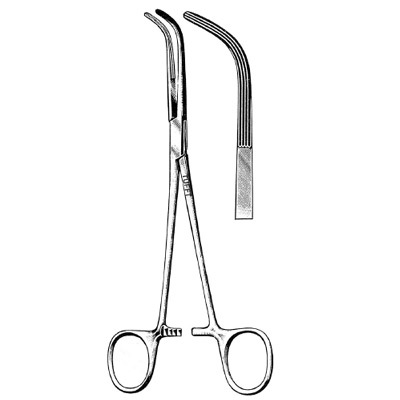 GALL DUCT FORCEPS 23CM / 9"
LAHEY (SWEET) GALL DUCT FORCEPS 23CM / 9"
LAHEY (SWEET) GALL DUCT FORCEPS 19CM / 7 1/2"